It’s rare, but sometimes you read a life changing book. It might be a religious text, a self help manual or even a work of fiction. But it had never happened to me. Until last year. I met author Paul Brown at a social function. He was softly spoken but possessed a quietly confident demeanour. His talk impressed me both in its delivery and content. He fielded questions in a manner which made me believe he knew his subject inside out. My curiosity was thoroughly piqued; I chatted with him afterwards and purchased a copy of his book. It was a book that terrified me and sent my emotions into turmoil. Why? Because I realised I was reading about something that could drastically change my life, my children’s lives and, more importantly, the lives of the entire human race. The subject was climate change. 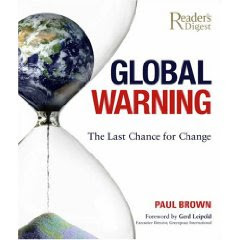 Global Warning, The Last Chance for Change is a factual book which aims to educate the layman about climate change and the very real possibility of global environmental disaster and massive population decline. It is a truly shocking book for not only will you discover the truth about climate change, but also how governments, politicians and businesses have been choosing short term political expediency and profit over the welfare of the human race. The subject matter is gripping enough but it has also been written in a style which makes it easily readable; each chapter containing both text and visually stunning photographs accompanied by captions. It doesn’t matter if you’re an advanced reader, an occasional reader or even a child because every chapter, every caption, every picture, tells a story; the story of global warming. If the information in this book was set in the context of a novel you would relish the intrigue, the greed, the lackadaisical manner of some of the key players as a tragedy unfolds and hurtles towards a dramatic ending. But unfortunately, it isn’t a novel. It’s a factual recount of a world on the edge of a precipice and although the finale may not yet be written, the prospects for a happy ending are looking increasingly remote. Amongst the many startling and interesting facts that come to light in this book, the most alarming is that numerous scientists believe a rise of 2°C will cause a tipping point which will plunge the world into irreversible, runaway climate change. 0.8° C of that rise is already proven. However, because C02 emissions take up to 30 years to have their full effect on the atmosphere scientists have suggested that it is impossible to prevent global temperatures from rising a further 0.7°C in the next few decades. This leaves only a 0.5°C window of opportunity and maybe only a few years in which to curb emissions if we are to avoid climatic chaos. If the point of no return is reached, the best available evidence suggests that the ice caps will continue to melt and sea levels rise. At the same time, decreasing land masses will be affected by the expansion of deserts and aridity as temperatures also rise. Initial flooding will be replaced by drought and fresh drinking water will become a valuable commodity. Huge environmental disasters will in turn trigger economic difficulties affecting each and every one of us. Food supplies will be threatened and there will be economic migration as whole towns and cities are forced to move as their homes and livelihoods become victims of the elements. Whole civilizations and cultures will either be displaced or die. Of course, there will be sceptics who will say that the book is scaremongering. However, looking at the facts recounted, it would seem many of the sceptics have vested interests; the power of politics and profit taking precedence over logic and reason. I was truly shocked by what I read, not just by the ignorance of such actions but because history is awash with societies that have been wiped out by abusing their environments. It's said history repeats itself - and it doesn’t take much foresight to realise the possible consequences of reaching a tipping point. Only this time devastation could be on global scale. Perhaps it’s not surprising then that Global Warning made me think carefully about the moral issues such a catastrophe would raise. Would countries who had previously fought over religion and politics now fight over food and water? Would the world work together as a global community or perpetuate the very selfishness that had brought society to such a point? Would lives be sacrificed to ensure the survival of mankind? Suddenly, worrying about whether I got the kids to school on time didn’t seem quite so important. I was glad, therefore, when towards the end of the book Paul investigates all the developments in renewable energy that can be used to replace fossil fuels which are the primary cause of CO2 emissions. The good news is that there is viable technology, be it wind power, solar power, hydro-electric and other forms of energy that can replace fossil fuel – whatever you might hear to the contrary. All over the world scientists are working towards a safer future where man lives alongside the elements, harnessing them for his own needs but without destroying the world on which we depend. But what Paul so clearly emphasises is that there has to be the political will to make the necessary changes. Because change we must - if we are to make this world safe for us and for our children. Whilst I was never a climate change sceptic, Global Warning The Last Chance for Change has had quite a radical impact on my life, even to the extent that I have changed my car for a more fuel efficient model. I've finally realised that time is running out. We can no longer talk. We have to act. Paul Brown is the author of 9 factual books, primarily on environmental issues. He worked for The Guardian newspaper for 24 years, the last 16 as their environment correspondent. He has met with numerous eminent politicians and scientists, attended climate change conferences and travelled to some of the world’s most remote places, including Antarctica. Although he left The Guardian in 2005 he still writes a weekly column in between travelling the world educating other journalists and continuing his campaign to raise awareness of global warming. Global Warning, The Last Chance for Change was published in 2006 and was a best seller in the United States. Paul is currently writing his first novel. You can find out more about Paul in my two part interview coming next week. In the meantime you can join millions of others across the world in supporting Earth Hour by switching off your lights on 28th March at 8.30pm local time. I really enjoyed this article, Jane, but without reading the book, obviously I couldn't comment on what you've said, even though things don't sound too bright. i know ignorance isn't an excuse, but changes are harder to make for some, more than others. I travelled to a site the other day and it took me seven hours, about 380 mile round trip. for me to change from a large engined car, would be a big ask. My business would be dramatically effected if these trips took longer, or took too much out of me, and therefore we'd need to work closer to home. In this economic climate, that would be suicide. i think the catch-22 has already arrived, and help is needed economically to make some of the enviromental changes possible. Not bad for someone who can't comment. Loved the article, Jane. Looking forward to the interview! Looking forward to the interview Jane - should be interesting! I'll go out to the shops and get some chocolate ready to eat whilst I read it - I'll walk of course! I'm pleased you enjoyed the article. The book really is worth the read; an absolutely fascinating insight into not only climate change but also politics and economics. It's true for a lot of people, particularly in the present econmic environment, investing in green technology is going to be hard. That's where governments have to step in and help; either with financial incentives or by clear directives - for the main part it seems to me that up to very recently they have been abdicating their responsibilties. Protecting the world from catastrophic climate change has to be more than providing recycling bins, but getting to grips with the real problem of energy sources and emmissions. Clearly, not everyone will be in a position to change their car immediately or do other things that require expensive outlay but there is so much more we could be doing - at the simplest level for example that would be changing light bulbs to long life bulbs and not leaving the TV on standyby. In Beijing they have changed all their street lamps to solar power! Simple but effective! Thanks Stella and Mike. The interview is coming soon! And the walking sounds good Mike! This is why we must invest more into solar energy technology pronto - that and space travel as I fear the only long term hope will be living under the sea or on another planet. How Space travel? Do you mean if it all goes wrong and we all have to pack? !